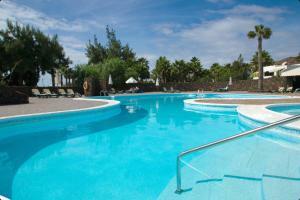 The 3-star Palmeras Garden offers comfort and convenience whether you're on business or holiday in Lanzarote. The hotel offers a high standard of service and amenities to suit the individual needs of all travelers. Facilities like car park, car hire, bar, bicycle rental, shared lounge/TV area are readily available for you to enjoy. Guestrooms are fitted with all the amenities you need for a good night's sleep. In some of the rooms, guests can find balcony/terrace, television, satellite/cable TV, kitchenette, refrigerator. Entertain the hotel's recreational facilities, including outdoor pool, diving, massage, tennis courts, billiards. Friendly staff, great facilities and close proximity to all that Lanzarote has to offer are three great reasons you should stay at Palmeras Garden. One of the community users reported us that the Palmeras Garden in Lanzarote is a diver friendly hotel.